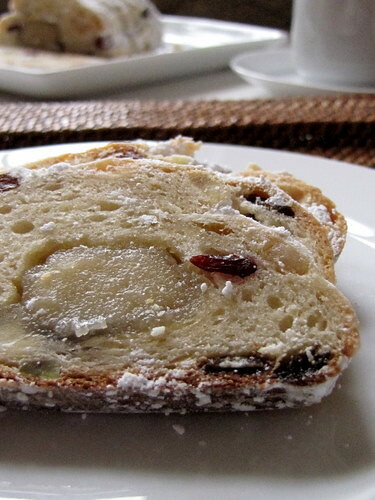 Christmas Fruit Breads: Panettone and Stollen ~ I Can Do That! 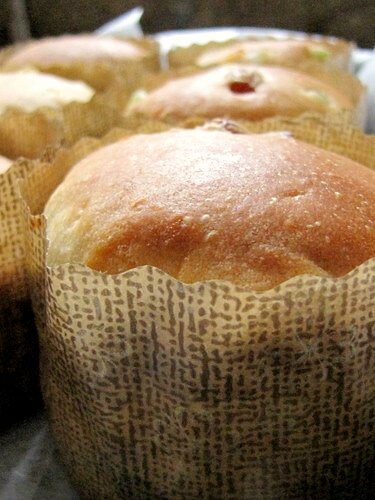 One of the breads in The Bread Baker's Apprentice Challenge that I didn't rate favorably was Panettone. It's only fair to give it another try, this time I followed the recipe from Artisan Breads Every Day also by Peter Reinhart. The cake/bread has sourdough starter which gives it a better texture and flavor, IMHO and I love it. This formula can also be used to make stollen and brioche but strangely, I didn't like the flavor of the stollen using this recipe. So I baked a batch of the BBA recipe which I knew a year ago was a keeper. The bread, or cake did not disappoint. It is delicious! Make the starter: Combine all the ingredients in a mixing bowl. With paddle attachment, mix on lowest speed for 1 minute, increase to medium and mix for 30 seconds. The starter should be dough-like, sticky but not tacky. Adjust with flour or water as needed. Transfer into the work surface and knead by hand for 30 seconds. Place on a lightly oiled container, cover with plastic wrap, and leave at room temperature for 8 hours. It will double in size. 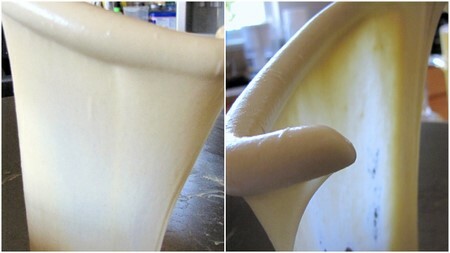 Make the dough: Cut the starter into 10 pieces and put in the bowl of a standing mixer. In a small bowl, stir the honey into the warm water until dissolved then whisk in the instant yeast. Let the mixture sit for 1 minute then add it to the starter. Stir to soften the starter. In another bowl, whisk the egg yolks, vanilla extract, and brandy then add to the starter mixture and stir until evenly incorporated. Add the flour and salt. With the paddle attachment, mix on lowest speed for 2 minutes. The dough will be coarse, wet, and sticky but will hold together. Continue mixing on lowest speed, gradually adding the sugar. Increase the speed to medium-low and mix for 5 minutes, scraping down the sides of the bowl when needed. Switch to the dough hook and mix on medium-low, adding butter 1 tablespoon at a time, waiting until each addition is well incorporated before adding the next piece. Mix until the dough is shiny, soft, and very supple, this should take about 5 minutes. Mix on medium for 5 minutes more until you are able to pull out long, taffy-like strands of dough. Shape the panettone: Add the fruits, mixing on lowest speed for 1 minute finishing by hand on the work surface. You may use dried fruits instead of candied citrus; or more, less, or none at all. 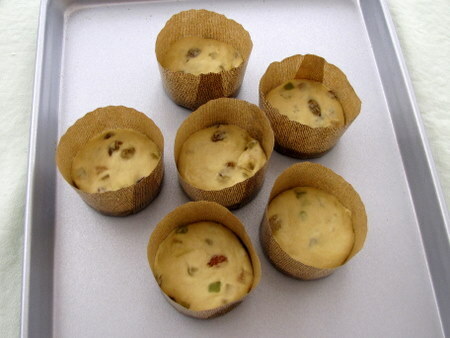 Weigh out the desired size, form into balls, and place in oiled molds: 24 ounces for a full size panettone mold; for very small molds, about 3½ to 4 ounces. Each mold should be 1/3 full. Place the filled molds on a cookie sheet and cover with plastic wrap. Place the sheet inside a food-grade plastic bag and let rise for 12 hours at room temperature. Bake the panettone: Preheat the oven to 350°F, 325°F for large size. Bake small ones for 30 minutes and large ones for 45 minutes to 1 hour or until golden brown all over. Internal temperature should read 185°F. Cool the large panettone upside down on a rack. That looks great. I having meaning to try panetone but I haven't had the chance. Joy, this recipe is worth the time making. Mas masarap and not as dry. Sally, yeah the BBA came out too dry and bland.